Your time is valuable. We both know this. Rather than spending hours searching around the internet for the right information, you could be expanding your business and creating new ideas. To save you this time, and hassle, I have put together an Ultimate Social Media Cheat Sheet. If you are reading this post, you probably use social media a lot. Correct? If so, then you will be aware of how often social media sites change their image dimensions. This can be a headache. 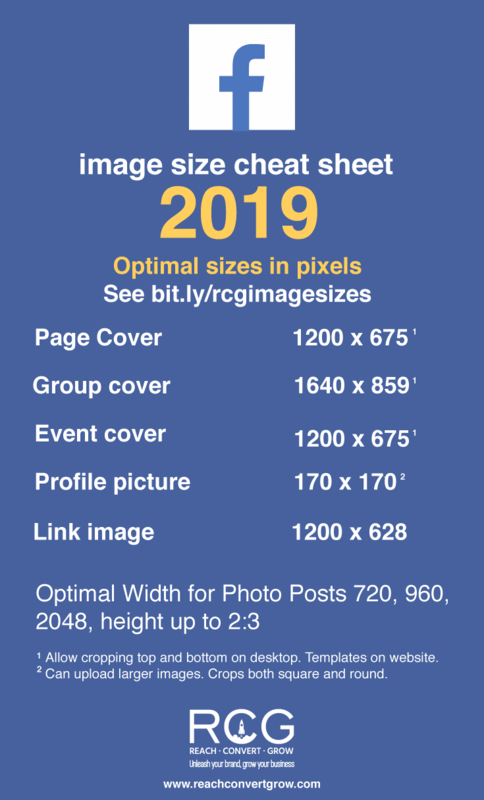 Luckily for you, this image size cheat sheet has all the information you need to make the perfect posts. What are you waiting for? Scroll down now to find the hidden treasures. 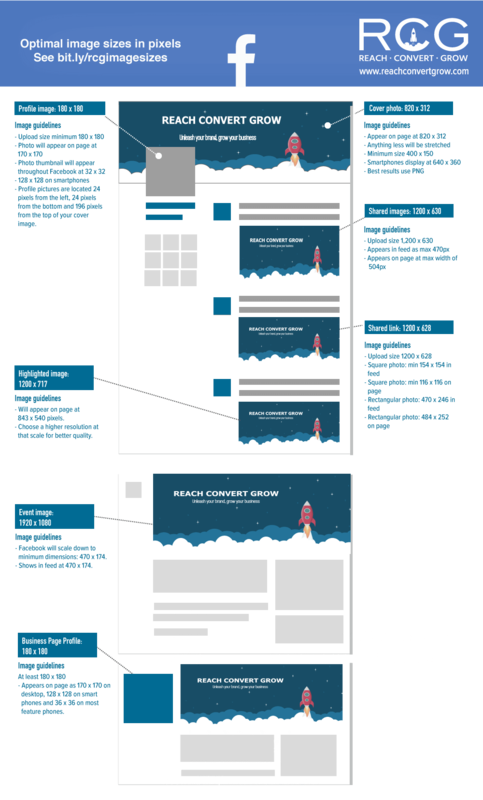 You will find below the essential, optimal and updated social media sizes, as of January 12, 2019. 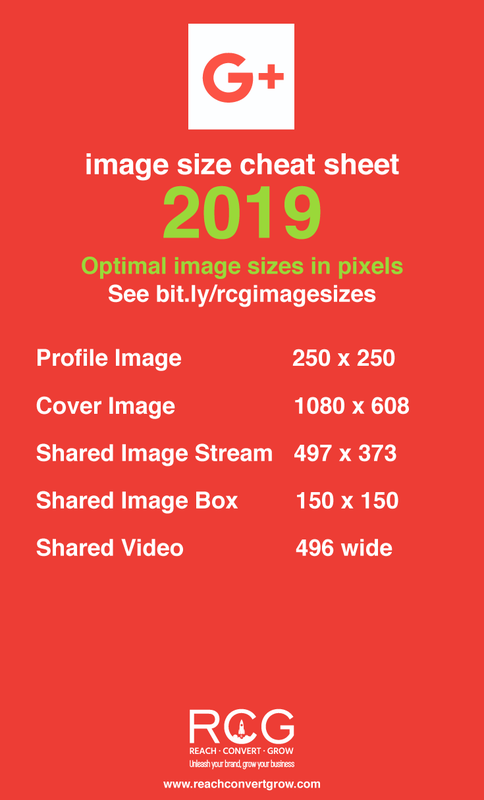 At the bottom of the page you will find an infographic of all the image sizes you need in one image. What’s more, I have listed ALL the essential sizes for Facebook, Pinterest, Instagram, Twitter, LinkedIn, AND YouTube on the infographic. You can use these to create blog posts that are armed and ready for social posting. If you’re interested in finding which platform is the most popular of to get some demographic data you can visit these posts: social media statistics and social media sites. For the first time, I’ve added in two new platforms to the list. With the growth of Chinese social media networks, it’s time to include the two big two social platforms WeChat and Weibo. Because I know a few of you are starting to Ello more and more, I’ve also added in Ello’s social media image sizes as well. 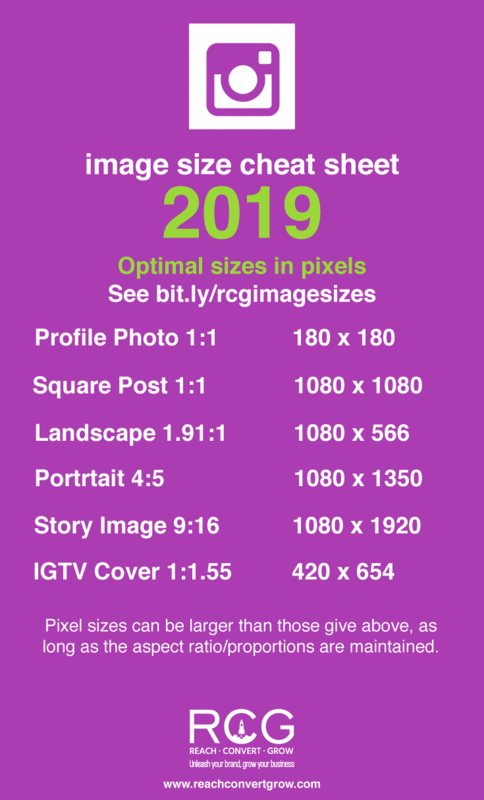 Social Media Image Sizes 2019 – What Matters? Some social media platforms are way more image heavy than others. With this in mind, it’s good to know what the common sizes are so you can create a more efficient workflow. Why create two images when you can use one for multiple platforms? 1200 pixels square is ideal for Facebook and Instagram posts. 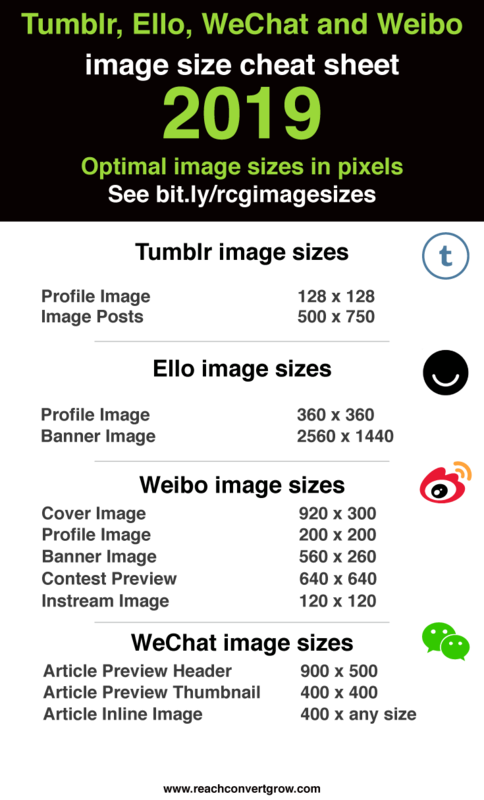 This social media image size looks good on Google+ and LinkedIn posts and even Twitter. As with most images you produce, you want to keep the main communication in the centre of the image. Another reason for this is that any cropping or changes to the image sizes will still leave them looking good. Squares can be used on Pinterest, but aren’t the recommended aspect ratio of 2:3. However, many people use them and they seem to fair well. If Pinterest is your main platform, then try the 2:3 aspect ratio. You will also then be able to use images on Facebook. Want to cover both Instagram and Pinterest? Then try a 4:5 aspect ratio. Note that it’ll still be cropped to a square on Instagram. Facebook, Twitter and Linked in are all recommending 1200 x 628 pixels, which is 1.91:1 aspect ratio. So you should use this image size across all your blog posts and pages. One of the easiest and quickest way to create social media image sizes is to one of the many image creation and editing platforms. You could use a free online photo editor like pixlr.com. Alternatively, you can use an online image creator that has lots of sizes already set up for you! One of my favourites is Canva, but probably the best in the market is Stencil. Both have a free option or free trial. The paid plans have an amazing Instant Resize feature, so you can make perfectly-sizes images for every network! Watch it on Stencil above. CLICK HERE TO TRY STENCIL FOR FREE! 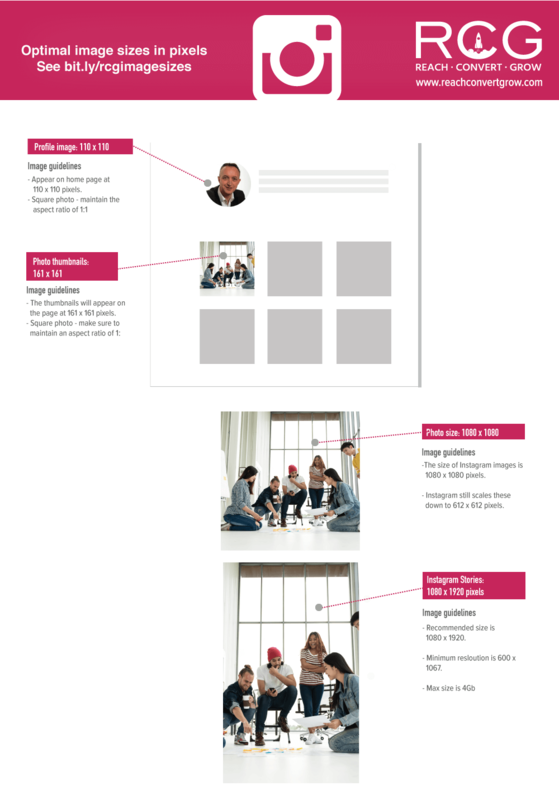 Although the Page templates vary for business type, the image sizes are all the same (so far!). The recommended aspect ratio for all Facebook cover photos is 16:9. However, whilst this looks ideal on mobile, the Desktop version will be slightly cropped. As a result, you need to your important text, or other main image feature, in the centre. Your choices then are: 1200 x 675, 1640 x 923, or 1920 x 1080. For the best results, use the largest possible size you can – as long as the aspect ratio is the same Facebook will generally, downsize the image to fit. This ensures you get the best image for your brand. Remember that now you can also use videos, 20-90 seconds long. Note that the video needs to be a minimum of should be at least 820 x 312 pixels. This is a step change in terms of how creative you can get with Facebook. Try it! 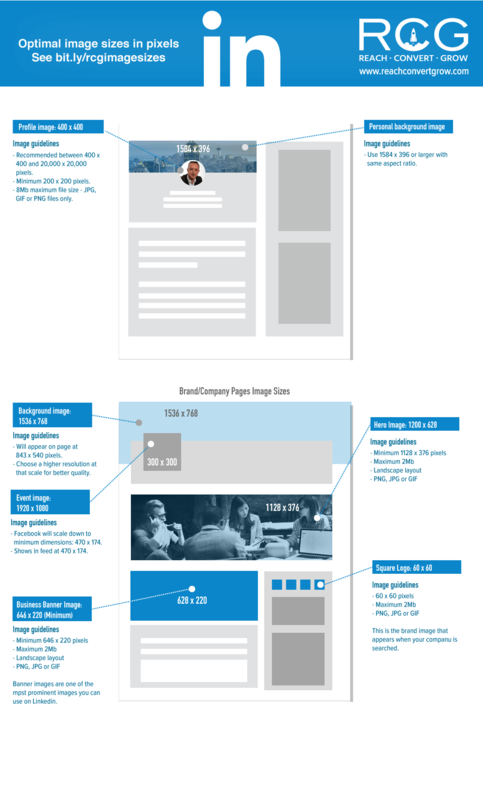 For a visual image of the Facebook image sizes, see the full infographic below. Facebook Profile photo size: upload 170 x 170 | Make the best Facebook Profile Picture. Facebook Link preview size: min 600 x 314 | How to get a LARGE link thumbnail. Facebook Event Cover photo size: 1200 x 675, see the post for details: Facebook Event Cover for Desktop AND Mobile. 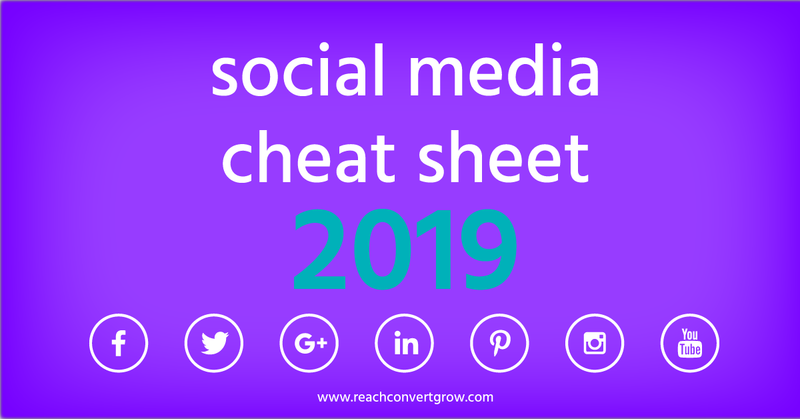 Pin this Facebook social media cheat sheet, and read on. The new recommended size is 1584 wide by 396 high. This is exactly 4:1 proportion. If your background image appears blurry or pixelated, then create an image with a large size as close to the maximum (8 MB) as possible. Moreover, use an image in PNG format, these tend to have less pixelation. 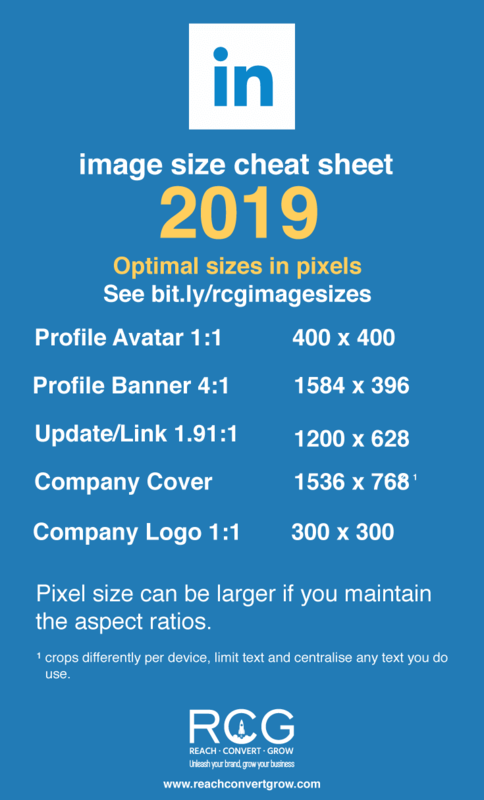 LinkedIn image sizes: Max file size 8MB and file type must be PNG, JPEG, or GIF. LinkedIn photo share: 1200 x 1200 square looks best on a desktop, but this is cropped to horizontal in a mobile feed. so it is better to use link share size. LinkedIn Company cover photo size: 1536 x 768 px. You can use this LinkedIn company cover photo template from Breanna Tillman: Download the LI company cover. See the recommended image sizes as suggested by Linkedin. Pin the Linkedin social media cheat sheet, and read on. Pin this Linkedin social media cheat sheet, and read on. Twitter Header size: 3:1 or 1500 x 500 pixels. 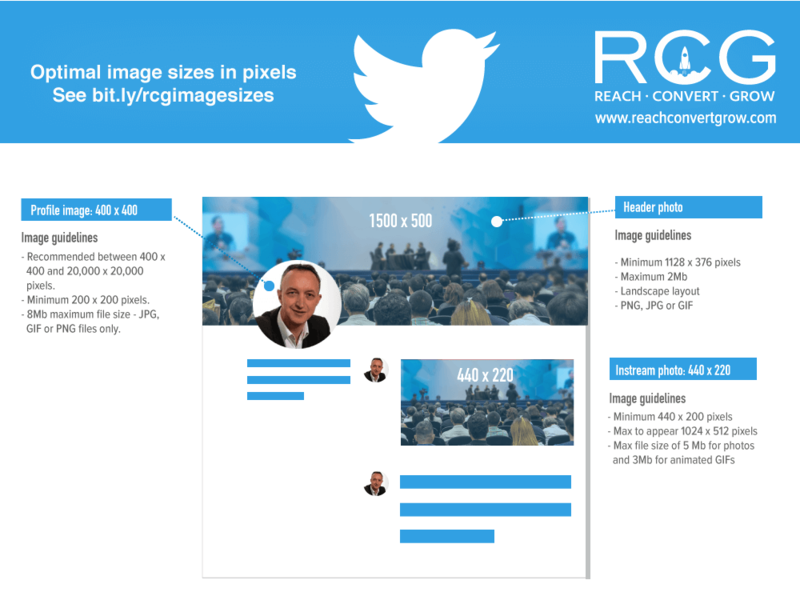 Twitter Profile size: 1:1 or 400 x 400 pixels. Tweeted Image size: 16:9 or 1200 x 675 pixels. Twitter Card image size: 1.91:1 or 1200 x 628 pixels. Tweet images are shown in full when clicked, so use a square image for portability across social media networks. However, they’ll be cropped in the feed on mobile. 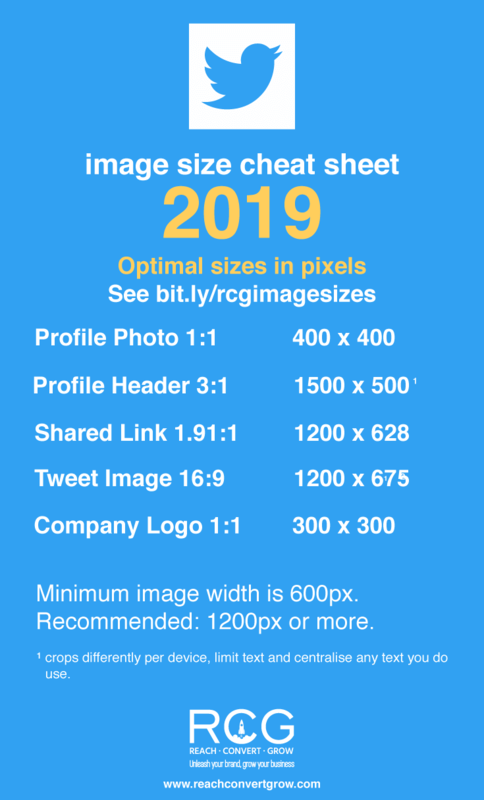 Pin the Twitter social media cheat sheet for images sizes, and read on. Pinterest has confirmed that Pins taller than 2.1 times their width are now cropped in the feed. They recommend 600 x 1260 as the tallest proportion for Pins. However, taller Pins will still be viewable in full when clicked. Pinterest’s recommended sizes are 600 x 600, 600 x 900, and 600 x 1260. Pinterest is recommending 2:3 proportion as optimal, e.g. 600 x 900 pixels. Pinterest board covers are SQUARE. I recommend 600 x 600. However, if you use the Showcase feature, you’ll want to make sure you make them at least 340 x 340. Pinterest Profile Photo size: 180 x 180 or larger. Maximum pin width when clicked: 564. Board cover: suggested minimum 340 x 340. Minimum image size that can be pinned: 100 x 200. 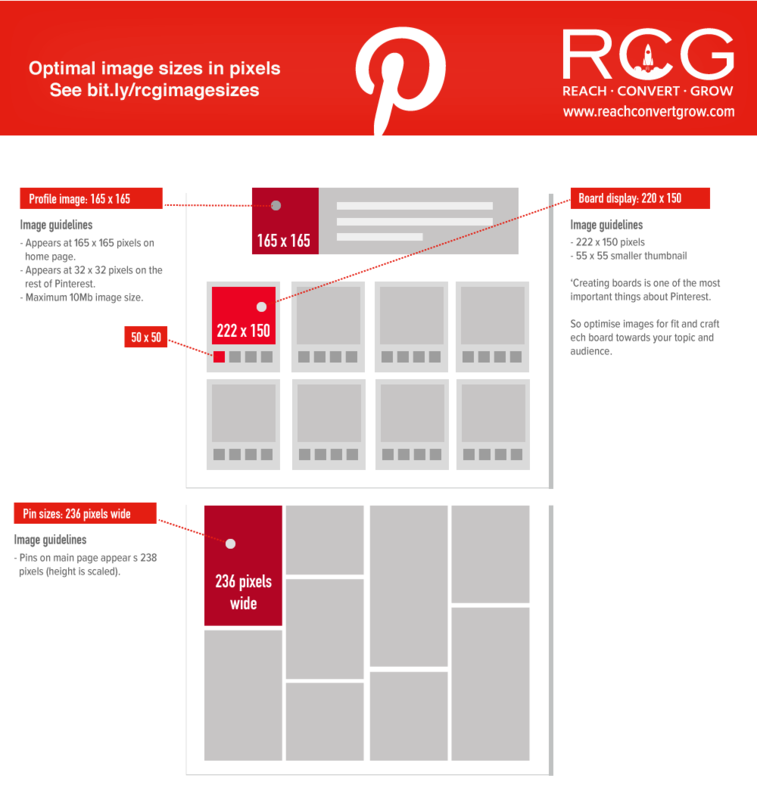 Pin the Pinterest social media cheat sheet for images sizes, and read on. Did you know that Instagram posts are no longer restricted to square? However, your images will still be cropped to a square ratio on your profile page gallery. Instagram Profile Photo size: 110 x 110 minimum. Instagram photo size: minimum 1080 width for best quality. Pin the Instagram social media cheat sheet for images sizes, and read on. YouTube Channel Art size: 2560 x 1440. Be sure to check the template as cropping varies widely from TV to mobile to desktop. Video thumbnail: 1280 x 720. Channel icon: 800 x 800. 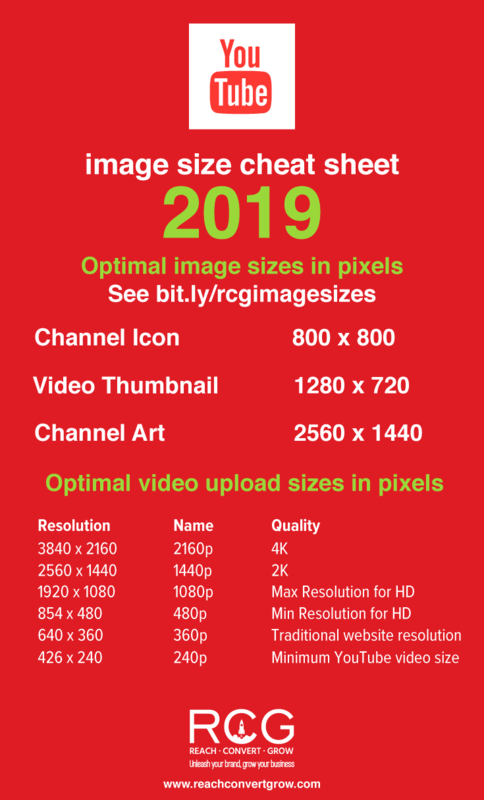 Pin the YouTube social media cheat sheet for images sizes, and read on. 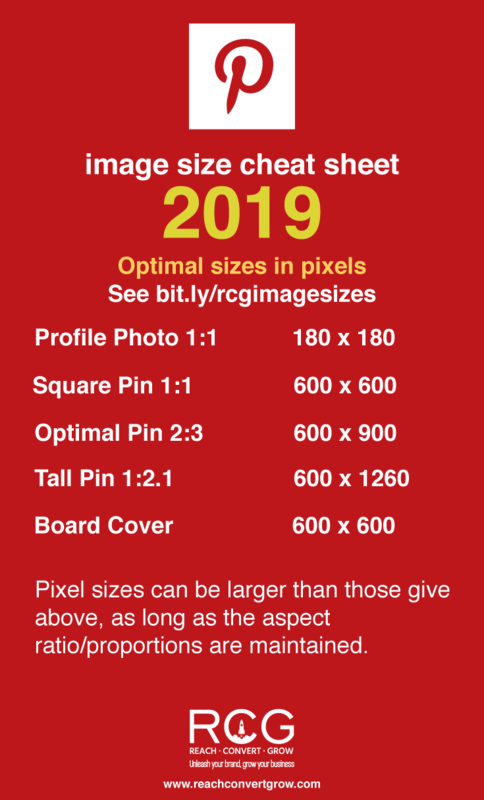 Pin the Google Plus social media cheat sheet for images sizes, and read on. Although most themes are different, the most common image size seems to be 500 and 400 width posts. However, the dashboard feed is resized to 540. Size limitations have also risen to 10MB for pictures, and supposedly 3MB for animated .gif images. Tumblr has implemented a “dashboard pop-over” with a header, which works both as a mobile theme and allows desktop users to have a quick glance at a blog without leaving the dashboard. The header displays at “various sizes” with an aspect ratio of 16:9. Generally, it displays at 1240 x 700 for desktop browsers but is optimized at 640 × 360 for mobile. 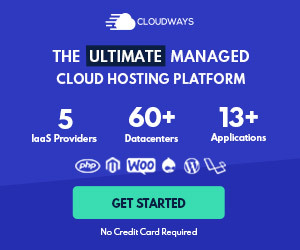 It’s also worth noting that users who choose to keep the default theme show the same header at 3000 x 1055 on their blog, and displays posts with a width of 540. Note: Ads served via Snapchat API. Contact us for more information.